In ontology-based systems that process data stemming from different sources and that is received over time, as in context-aware systems, reasoning needs to cope with the temporal dimension and should be resilient against inconsistencies in the data. Motivated by such settings, this paper addresses the problem of handling inconsistent data in a temporal version of ontology-based query answering. 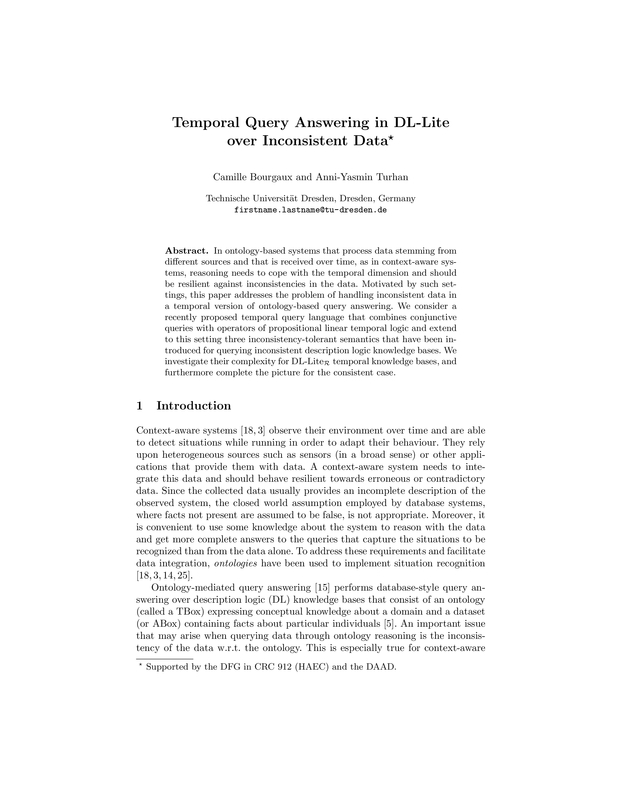 We consider a recently proposed temporal query language that combines conjunctive queries with operators of propositional linear temporal logic and extend to this setting three inconsistency-tolerant semantics that have been introduced for querying inconsistent description logic knowledge bases. We investigate their complexity for DL-Lite R temporal knowledge bases, and furthermore complete the picture for the consistent case.